The “blue wave” rolls back in. The past three weeks of polling have triggered many a liberal’s Post-Trump Stress Disorder. For most of last year, Democrats enjoyed a nearly double-digit lead in the generic 2018 congressional ballot, while Donald Trump’s approval rating sat beneath 40 percent — and the GOP’s top agenda item looked to be the most unpopular piece of tax legislation in modern American history. 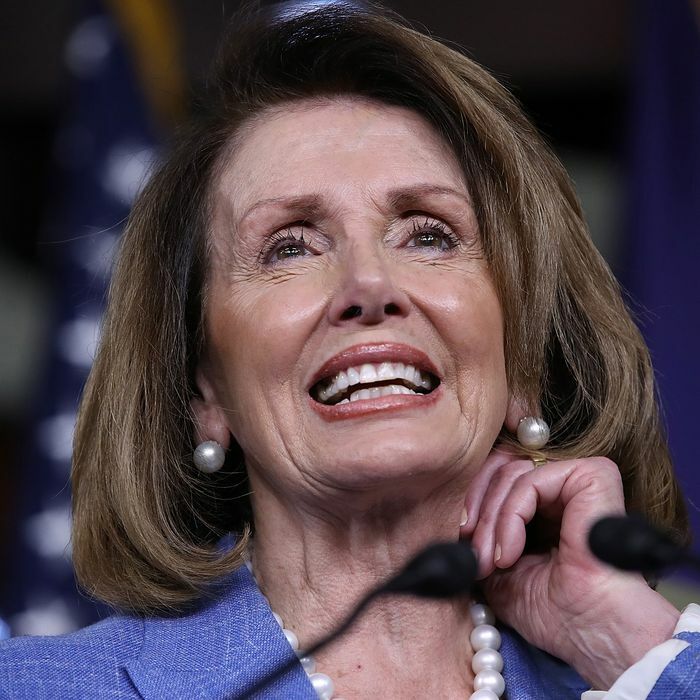 In late December, FiveThirtyEight’s poll of polls had the public favoring a Democratic Congress over a Republican one by 13 points; the question wasn’t whether Team Blue would win a historic victory in this year’s midterms, but rather how historic that triumph would be. And then, just as it had in November 2016, blue America’s inevitable triumph suddenly revealed itself to be eminently evitable: By early February, the Democrats’ polling advantage had narrowed to just six points — a margin that would likely be too small for the party to overcome Republican gerrymandering and reclaim the House. Meanwhile, Trump’s approval rating had cracked 40 percent for the first time since last May, and the GOP tax bill was steadily gaining support. Some pundits started to rethink their predictions of a blue wave; some progressives started to reread the FAQs for immigrating to Canada. But this pessimistic panic was (probably) premature: Five of the last six major polls of the 2018 congressional race have put Democrats up by at least eight points — with Marist and Quinnipiac University showing Team Blue’s advantage at 11 and 15 percent, respectively. The Quinnipiac finding is especially encouraging. The (historically quite accurate) pollster has been kind to Democrats throughout this whole cycle. But its last survey, taken the first week in February, showed the Democratic advantage falling to 9 percent — the party’s worst showing in a Q-poll for several months. Thus, the university’s latest findings suggest public opinion about the 2018 race may be reverting back to its long-term mean. And a newly released Economist/YouGov survey — which shows the Democrats gaining four points since the second week of this month, to recover the 8 percent lead they boasted in late December — echoes that signal. As of this writing, poll averages from RealClearPolitics and FiveThirtyEight both have Democrats up by more than 8 percent, which would almost certainly be a big enough wave to knock the Speaker’s gavel out of Paul Ryan’s hand. This return to the long-term polling trend isn’t exactly surprising. Such reversions to the mean are typical in election polling. But, in this instance, there had been some reason to suspect that the GOP’s gains weren’t transient noise, but rather a durable shift in the race’s dynamics. After 11 months of legislative impotence, congressional Republicans finally passed a piece of major legislation just before Christmas. And while the Trump tax cuts polled poorly at the time, conservatives argued that the public would warm to the law once it went into effect. Their reasoning was simple: The law would provide at least a modest tax cut to 80 percent of American households — and yet, in polls, only a tiny minority of voters said they expected the law to lower their taxes. Thus, when Americans saw higher paychecks in February — and realized that the Democrats had misled them, while Republicans had worked to make them richer — the “blue wave” would recede. I derided this story as a wishful fiction. But earlier this month, it appeared to be coming true. 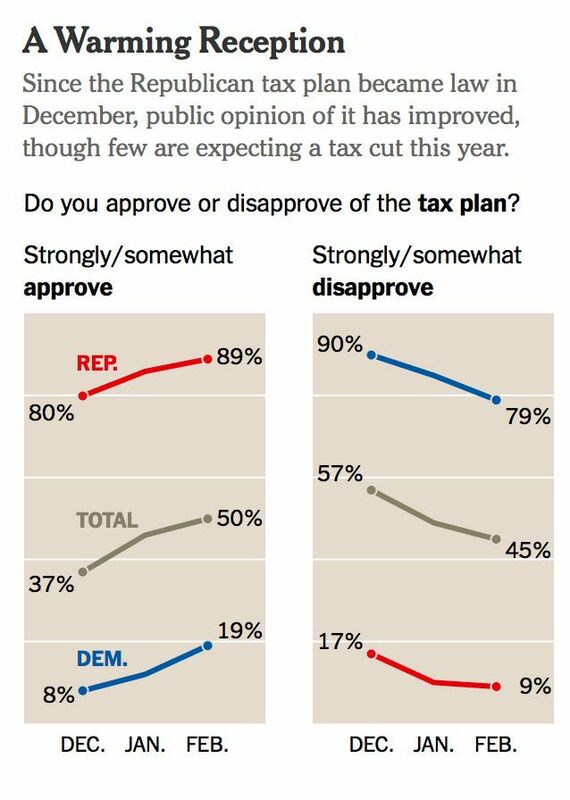 In December, only 37 percent of Americans supported the GOP tax bill in the New York Times/SurveyMonkey poll; by January, that figure was 46 percent; by February it was 51. Other polls showed a similar trend. And the correlation between the tax bill’s rising favorability — and the Democrats’ declining lead — was strong enough to suggest causation. It remains plausible that there was a causal relationship between these developments. But the idea that the Trump tax cuts would provide Republicans with a large and durable polling boost is looking less likely — and not just because Democrats’ poll numbers have recovered. Even as voters have warmed to the Republican tax bill, most remain adamant that they have not personally benefited from it. Only 33 percent of respondents in the latest SurveyMonkey poll said they expected to pay lower taxes under the new law; a newly released Politico/Morning Consult survey puts that figure at 25 percent. By now, most Americans have already received their first post-tax-cut paycheck; the fact that the vast majority did not discern any tax break within it is a testament to how modest the bill’s benefits are for ordinary Americans (and a dispiriting sign for Republicans). Given the fusillade of scandals, atrocities, and culture-war skirmishes that litters each day’s headlines, it’s impossible to know exactly which developments polls are (or aren’t) responding to. But here’s one plausible explanation for what we’ve seen: The GOP’s multimillion-dollar ad campaign in support of the tax law — combined with the stock market surge that followed its passage — convinced a significant number of Americans that the legislation had been good for the economy, and was therefore, worthy of their approval. And this development, among others, boosted the standing of the president and his party. But since these gains were rooted in advertising and stock market trends — rather than in Americans deciding that the Trump tax cuts had made a significant material difference in their lives — the Republican resurgence proved evanescent. The public might grow to like the tax bill, and its passage might earn Trump more credit for the growing economy he inherited. But, for the moment, the legislation doesn’t look sufficiently popular to blunt public disgust with the president’s daily obscenities — or the fanatical enthusiasm of the anti-Trump grassroots.